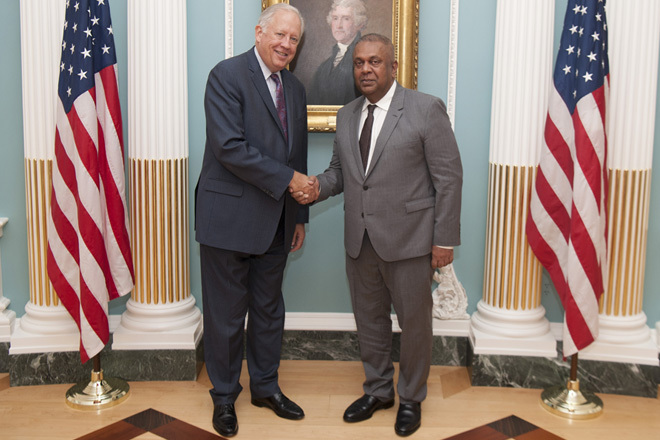 The Minister of Finance and Mass Media Mr Mangala Samaraweera who is currently in Washington to attend the World Bank/IMF annual meeting met with the US Under Secretary for Political Affairs Ambassador Thomas Shannon, today at the US State Department. Ambassador Shannon will visit Sri Lanka in November 2017 to take part in the next round of the US / Sri Lanka Partnership Dialogue, which was inaugurated in 2016 when Mr. Mangala Samaraweera was the Minister of Foreign Affairs for a regular policy consultation designed to discuss and identify opportunities for cooperation across the full range of bilateral and regional issues. The Partnership Dialogue demonstrates the consolidation of cooperation between the United States and Sri Lanka and serves to further strengthen and enhance bilateral relations in the widest sense, through regular and structured engagement. Finance minister Mangala Samaraweera was accompanied by Mr.Mano Tittawella, Snr. Adviser to the Minister of Finance, Prof. Gamini B. Keerawella, Charge d’ Affaires of the Sri Lanka Embassy in U.S.A and Mrs.Priyanga Wickramasinghe of the Sri Lankan Embassy in U.S.A.